FRANKFURT -- U.S. authorities have found three unapproved software programs in 3.0-liter diesel engines made by Volkswagen Group's Audi unit, German weekly Bild am Sonntag reported, without saying where it obtained the information. 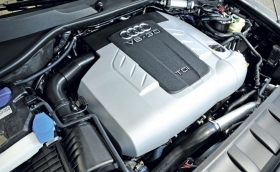 The software allowed the turbocharged direct injection engines used in the Audi Q7, Porsche Cayenne and VW Touareg models to shut down emissions control systems after about 22 minutes, the paper said. Official methods to measure emissions usually last about 20 minutes, it said. Volkswagen has admitted it skirted U.S. diesel-emissions tests for years and said in June it would spend as much as $15.3 billion buying back vehicles from consumers and providing funding that could benefit makers of cleaner technologies. That settlement however would not address about 85,000 larger 3.0-liter Audi, Porsche and VW vehicles that emitted less pollution than 2.0-liter vehicles but were also fitted with illegal emissions-control equipment. Audi and Volkswagen notified U.S. authorities about these vehicles last year. A deal covering the 3.0-liter vehicles may still be months away. Audi managers are scheduled to appear at a hearing in front of U.S. environmental authorities on Aug. 10, Bild am Sonntag said, adding the automaker was bracing for a substantial penalty payment. An Audi spokesman declined to comment, only saying that talks with U.S. authorities continued and were aimed at a technical solution for the problem. The diesel-emissions violations continue to undermine VW's U.S. sales, business and reputation and have already cost it billions of dollars. It still faces criminal charges and lawsuits in numerous countries.